Sterling silver chunky RHODOCHROSITE stone ring UK O¾-P/US 7.75. Gift Bag. 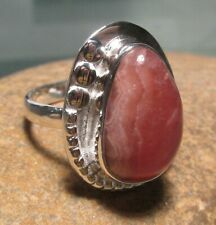 This is an unusual stone and solid silver ring with natural rhodochrosite stone in a silver setting;. Set into a silver band and setting. Band width 3 mm. The ring pictured is the one you will receive. Note :All jewelry photos are taken by professional photographers. Ring Size Chart. International Ring Size Table. We deal in best quality Antique & Tribal Jewelry products. In any case. We will do our best to resolve any. problem and to make you satisfied. A stunning sterling silver ring.inlaid with a pink white Rhodocrosite. Material: Sterling Silver (92.5% silver content). Stamp: 925. Sterling Silver tarnishes on prolonged exposure to air and water. A stunning pair of sterling silver earrings inlaid with Rhodocrosite. Stamp: 925. Sterling Silver tarnishes on prolonged exposure to air and water. Do not use abrasive cleaners or liquid cleaners. A stunning sterling silver pendant inlaid with Rhodochrosite. Stone(s): Rhodochrosite. Stamped: 925. Category: Pendant. A really Superb Stylish Sterling Silver and Rhodochrosite Pendant with a Generous Modern Silver Setting. Wonderful Colouring. A stunning sterling silver ring inlaid with Rhodochrosite. Stone(s): Rhodochrosite. Stamp: 925. Sterling Silver tarnishes on prolonged exposure to air and water. Do not use abrasive cleaners or liquid cleaners. A stunning sterling silver pendant.inlaid with a Pyrited Rhodochrosite. Stone: Pyrited Rhodochrosite. Stamped: 925. Category: Pendant. Material: Sterling Silver. A stunning pair of sterling silver earrings inlaid with Rhodochrosite. Stone(s): Rhodochrosite. Sterling Silver tarnishes on prolonged exposure to air and water. Do not use abrasive cleaners or liquid cleaners. We are the manufacturer of Artisan Handcrafted 925 Sterling Silver Jewelry with One-of-a-Kind Gemstones which personally designed from the inspiration from those little things around us. Despite our vast product range, it is our endeavor to keep every design unique, and every creation a piece of art. Note :All jewelry photos are taken by professional photographers. Sterling silver huge 26gr rhodochrosite/pearl/gemstones pendant. Gift bag. This is a large classic multi-stone pendant, featuring rhodochrosite, river and biwa pearls, and cut gemstones of citrine and blue iolite. Set into a solid silver mount with a loop bail. Handmade in India with 925 silver. STONESRHODOCHROSITE,RED GARNET. Santa Rosa Turquoise Handmade Solid 925 Sterling Silver Pendant Size 2.25". Artisan Crafted Jewellery. Sterling Silver House. (US only). We Are Social. Note :All jewelry photos are taken by professional photographers. UK / Australia / South Africa. Ring Size Chart. International Ring Size Table.